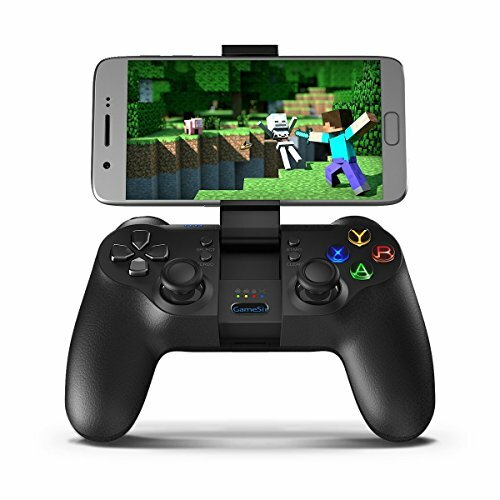 This rechargeable gamepad is a high precision bluetooth wireless gamepad; Attached wire USB cable would working great with Windows(PC), Steam, PS3 and Android TV Box. Clear LED buttons helps gaming great. And the brightness adjustment of "XYAB" button lights can be easily adjusted for power saving and for different gaming needs. There are 4 levels of brightness degree in total. Vibration motors gives your games the ultimate experience, 3D feeling achieved though this gamepad. T1 makes the vibration intensity and vibration frequency adjustment becomes reality. Press Clear + Up/Down button of the D-pad to choose the higher/lower vibration frequency. LED lights for quick checking the battery power - just press the "Home" button and the four LED light will flash in turn and each represents 25% of the power. Charging status indication: four blue lights will flash in turn; Fully charged: four blue lights will stay on. System Requirements: Android 4.0 or later, Windows 7 or later. Built-in Multi-angle Adjustable Bracket - Allows you to easily swap between mobile and PC. Unfolding the phone holder for 3.5~6-inch smart phones; folding the bracket for PCs. Ergonomic Design - add more comfort in game play sessions, 360°analog joystick with no dead-zone; incredible precise D-pad ensures for more gaming fluency, giving your games ultimate experience. Rechargeable lithium ion battery provides 18 hours continuous gameplay. Games Compatibility - For Windows PC and PlayStation 3, GameSir T1 supports most of gamepad enabled games; For Android smartphone and Tablet, you can find a list of compatible games in Free App "Happy Chick" game emulator (for retro games) and GameSir World (for popular smartphone games), you can scan the QR Code in User Manual to install them. View More In PC Game Hardware.